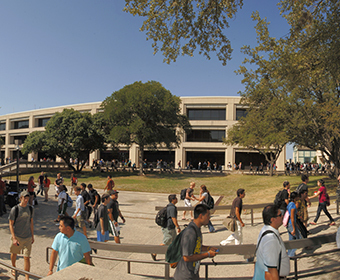 (March 26, 2018) -- As a next step in measuring the university's current environment, The University of Texas at San Antonio (UTSA) has issued a Campus Climate Survey to all currently enrolled students. The survey, which has been e-mailed to students and is open through Saturday, April 14, follows a similar tool administered to all UTSA faculty and staff in the fall, from which the results were released earlier this month. The President's Initiative on Diversity and Inclusion will be heavily informed by the results of the student survey, faculty/staff survey, and direct input from students via the Student Action Coalition, Student Government and other groups. "For an institution with more than 30,000 students, our voice is a critical piece of the puzzle to understanding how UTSA fares in its support, engagement and inclusion of underrepresented groups," said Student Government Association President Marcus Thomas. "I encourage all undergraduate and graduate students to take time out of their day to respond thoughtfully to this survey." Selected by student leaders, the online survey was developed by EAB, a consulting firm that has worked with UTSA on a number of initiatives, most recently the Student Success Task Force. In partnership with the UTSA Office of Institutional Effectiveness, EAB will analyze and interpret the data. Survey responses will be kept confidential. Learn more about UTSA's Strategic Vision.